In the midst of an entire weekend spent in airports and airplanes (about 80 percent of my time between Friday night at 10 EST to 12:30 a.m. Monday), I was able to squeeze in 90 minutes in downtown Amsterdam, The Netherlands. I had hoped to walk a full loop of the city, but instead only got to jump off at the Amsterdam Centraal train station and briskly walk through frigid, 10-degree temperatures in the famed Red Light District. 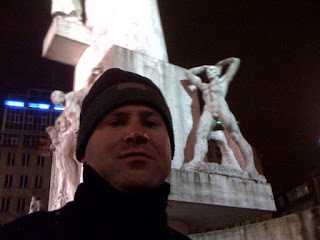 That's me above entering the area next to an oddly phallic statue. 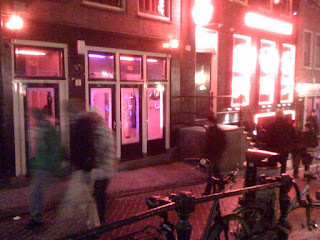 Passed the "coffeeshops," hookers in windows, headshops, and an endless variety of pizza-by-the-slice dives. The picture to the left is a photo next to one of the city's many canals, where the ladies of the evening were displaying their wares in the front windows (you can barely make some of them out if you look closely). If the windows had white blinds drawn, that meant they were temporarily busy and not open for more business. Fascinating, but I had no time to enjoy any of the local delights because I had to get back to the airport Sheridan so as not to worry about missing the last train.